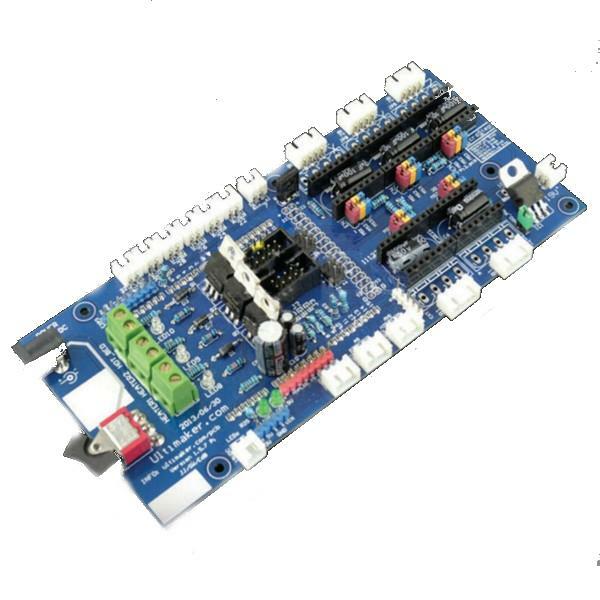 This product is an Arduino MEGA as Ultimaker UltiStepper drive is compatible with Pololu stepper driver boards. It is very similar to other electronic Pololu based implementation, including RAMPS, and it can support up to five stepper motors (three for the X, Y, Z, a function of one of the other extruder). You can add as much as you need stepper drive carriers. It is designed to run at a higher voltage than 12 volts, which allows you to put a 90-watt MOSFET and run your stepper motor with more torque and higher top speed. It has a head, increasing the SD card module, IDC header add LCD panel (movie), PWM output power LED arrays and other lighting and serial I / O, bluetooth and Ethernet add-ons. Note: Connect Jumper (nearly VR tube 7812TV), Arduino MEGA Ultimaker control panel will also have the power. Simple 4-way JST connector plug for all motors. Stepper motor control up to five (X, Y, and Z-axis extruder (the "E-axis"), optionally can be added by adding a second shaft Pololu stepper drive. Step will be configured via jumpers. All leads are breaking the maximum scalability from 15V to 19V. Thermocouple input, or thermistor input. 100K thermistor recommendations. Power on / switch at documented board. (Normally open) fan-cooled electronic device includes a 12V regulator. Now LCD backlight dimming can be controlled by software.